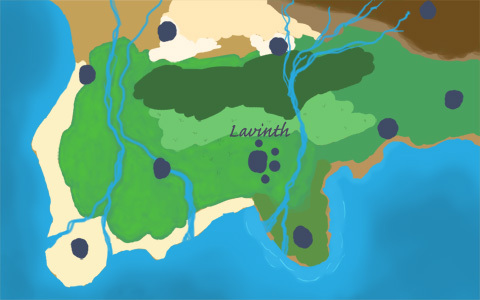 There's a lot of activity and many places to visit in Lavinth. There are a variety of shops and the battle arena is open to those who want to train or try their luck at capturing elons. It looks like Clayton is in town as well and ready to buy or sell elons to passing adventurers. Clayton is a traveling elon breeder and seller. He is pretty knowledgeable about elons if you have any questions. Battle your elons against wild elons gaining strength and loot. Rosa runs the apothecary and will heal your elons for a cost. A sign by the door reads "We have the best prices on Food in all of Lavinth!". It's a small shop that doesn't stand out much, the sign by the door reads "Prisms of All Kinds". A colorful toy shop you see many variations on the windows all with a unique homemade charm. Keep your coins and elytes safe while earning some interest. Purchase Elytes, a rare and valued currency in Eliyo. You see a sign by the door that reads "Free Meal! Bread and water for those in need". Many adventurers sell their wares here. Open your own as well.